In 1972, Pampanga native Jaime "Jimmy" Salvador joined the Sbarro business. Jimmy worked alongside the original founders and their sons, living and breathing the family brand. He worked in operations as a store manager, then ran the corporate commissary in Brooklyn, and eventually served as Sbarro’s ﬁrst Area Manager. Then, in 1989, after 17 years of living in New York and working with the Sbarro family, Jimmy returned to the Philippines — carrying the Sbarro brand with him. Along with Ma. Teresa Rodriguez and her family, he opened the ﬁrst Sbarro Philippines branch at the Annex in SM North Edsa in 1990 — the ﬁrst Sbarro in all of Asia. Years later, Sbarro Philippines expanded to the Visayas, thanks to a partnership with Gerardo Luzuriaga and Marcelino Florete, Jr.
And so today, Sbarro Philippines continues to satisfy the cravings of Filipinos with 25 branches nationwide. And through all these years, Jaime Salvador – together with his family – ensures that Mama Sbarro’s legacy remains unchanged: the commitment to good food, fresh ingredients, excellent service and great value for money. It's been 44 years now and Sbarro still continues to provide great food to food lovers especially those who crave for pizzas and pastas. 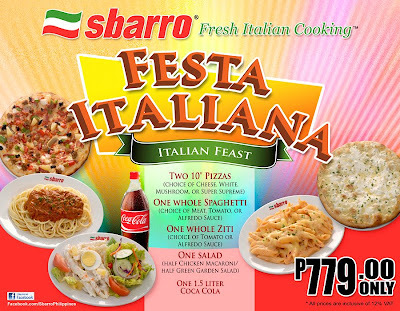 Avail of Sbarro's great offer. Like Sbarro Philippines on Facebook to get updates on promotions and new offers.